I was recently approached by a company whose WordPress website had unfortunately been hacked. This post details the forensics I performed during the clean-up operation. I’ll also note specific WordPress security recommendations based on my analysis. 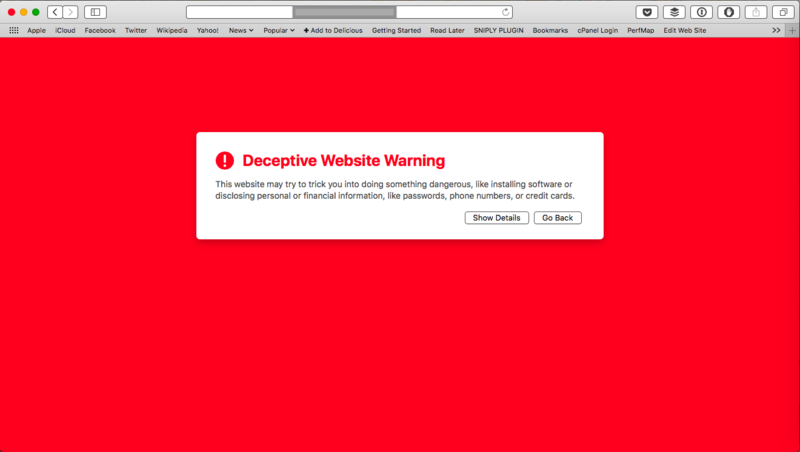 Ignoring the warning and entering the site showed a black page with a “Rooted Syntax” logo (shown below). A quick Google for “Rooted Syntax” led me to a hacker group’s Facebook page, which contained posts with details about sites they have defaced and hacked. It was also clear from a Google search that other sites had been defaced in the same way. My first task was to SSH into the server where the hacked site was hosted to look at the WordPress root. I immediately noticed a few oddities that wouldn’t normally be part of a WordPress base install. As well as the non-standard files, I also noted the timestamps of the files — the original install had been done on March 20th, and it was clear that files had been added (e.g. wso.php) after that date. To start the clean-up, I moved the document root to another location for further analysis and installed a new static HTML holding page for the site. 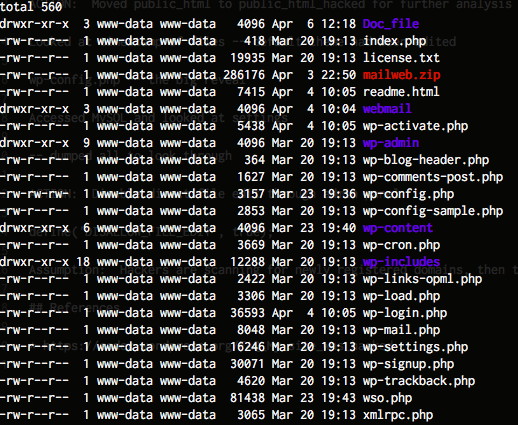 One of files that was modified since the original install was wp-config.php which I opened up to look for clues. 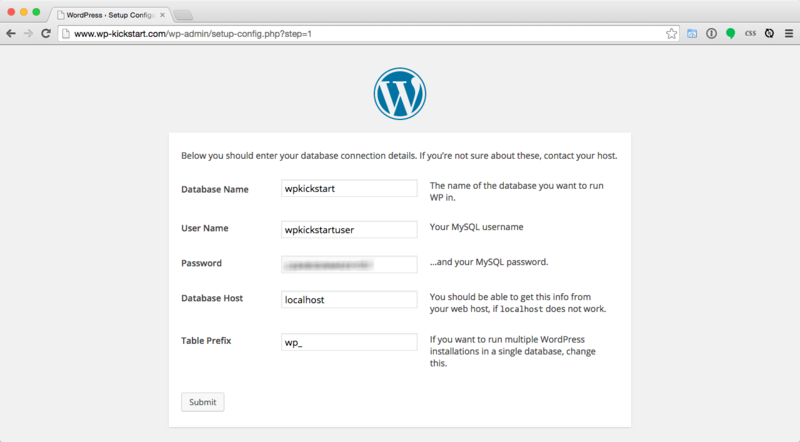 Upon viewing, it was immediately clear that the hacker had completed the WordPress install by entering their own MySQL credentials, which was hosted on a server used by the hacker. Using those MySQL credentials, I was able to run SQL queries from my client’s host to help my investigation. I ran SHOW TABLES and it showed me 2,310 tables — considering each WordPress instance uses 12 tables by default, that makes approximately 192 hacked WordPress installation on this one MySQL server. The $table_prefix option in the MySQL wp-config.php had been use to give each install a unique prefix. I was interested in seeing what files, if any, had been recently edited through the WordPress admin system. I ran the SQL select option_value from jhmxeoptions where option_name='recently_edited'\G to see what files had been recently edited by an admin user. 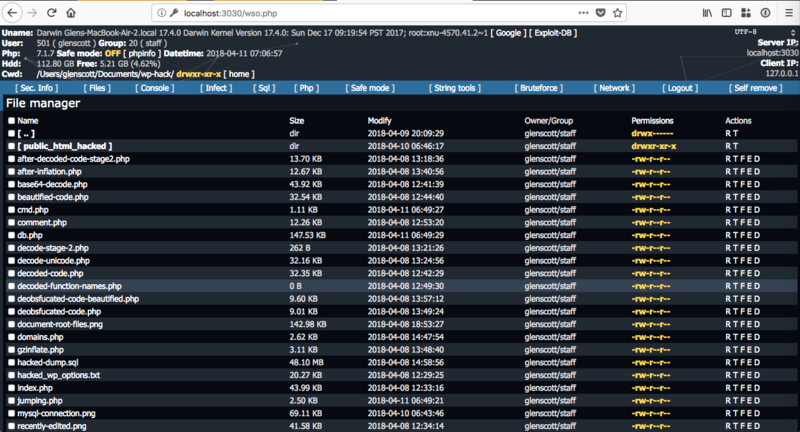 It was now clear that the hackers had gained control of the site by entering their own database details, and subsequently altered the homepage of the default Twenty Seventeen theme by dropping in this new index.php file via the admin system. Within the index.php was a large amount of obfuscated code. 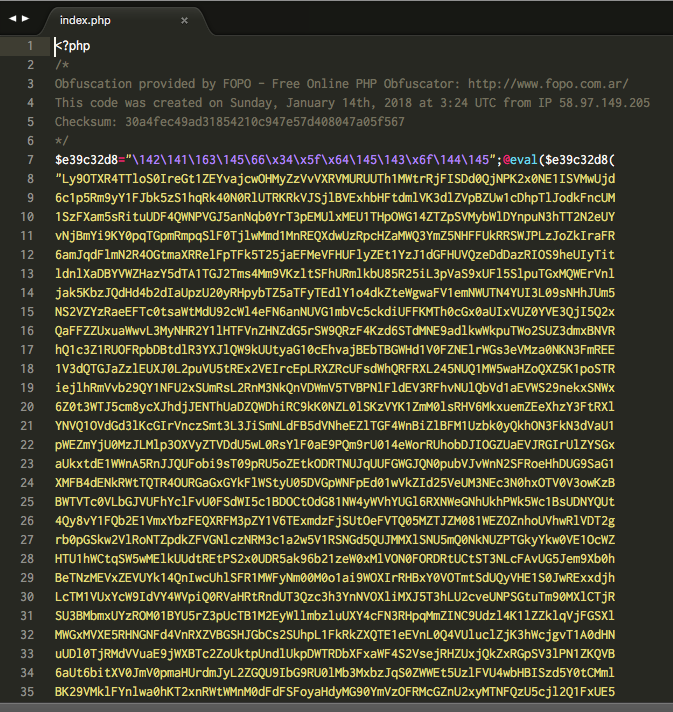 The hackers left in a comment to the tool used to generate the obfuscated code: FOPO. Unfortunately, the tool won’t un-obfuscate code without a cipher key, which I didn’t have. I had to decode the code by hand. (edit 12th April 2018: after this post was published, I was pointed towards a FOPO-PHP-Deobfuscator script which would have decoded the code automatically). Examining the source code more closely revealed that many of the actions of the script are to download and install malicious scripts from remote locations, including the previously found wso.php. Additional scripts are downloaded by passing in the root GET parameter, for example index.php?root=domains. After gathering this information, I was clear that the hackers could have accessed other parts of the web server. I continued my investigation by looking for other malicious files across the filesystem, but found nothing. I haven’t detailed all of the steps that I took regarding cleaning up the server, as there are already many good articles out there that explain the process (e.g. FAQ My site was hacked or How to Clean a WordPress Hack). I did reach out the abuse@ address for the network that owns the IP address used by the MySQL server so they can take further action. My assumption for this particular case was that hackers are scanning for websites on newly registered domains, then trying to see if a WordPress setup has been completed. If they find such a scenario, they are then taking over the site by putting in their own MySQL details. Scanning for such sites is trivial, for example, Shodan allows you to search for websites exposing the wp-admin/setup-config.php installation script. Do not leave WordPress in a semi-installed state — even if it’s on a domain name that you have newly registered and/or not publicised. Need professional help to clean up your hacked WordPress site? I’m available for hire. I’m a freelance software developer with 18 years’ professional experience in web development. I specialise in creating tailor-made, web-based systems that can help your business run like clockwork. I am the Managing Director of Yellow Square Development. This entry was posted in php, security, wordpress on April 11, 2018 by Glen Scott. A nice play-by-play summary. Enjoyed reading it. Interesting and full of really useful information / details, thanks for taking the time and effort, much appreciated. 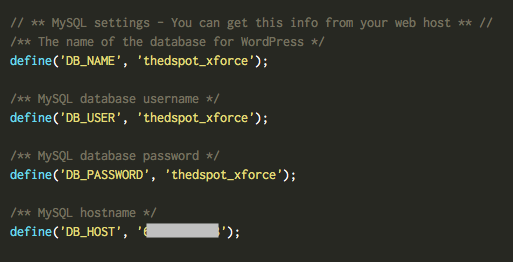 Anything interesting hiding in the wp-login.php file (and wp-activate.php)? It stood out for me because the timestamp is April, so it’s been modified since the initial install in March. Could just be a WordPress update — which is very nice of the hackers, upgrading the installed WordPress while they hack it. This is a common newbie hacked website, most of these cases the hacker ran a mass-deface tool and got luck, uploaded a mailer send spam that 99.99% of the time would go to the spam folder, and then defaced the website, which i don’t think it was done automatically because they uploaded these webshells from hard_linux.